Artie Vierkant will probably be very happy to see reproductions of images from his China Art Objects exhibition presented here. The sumptuousness of these Image Objects, roughly five-foot-high digital outputs mounted on shaped wooden boards, is hard to ignore. 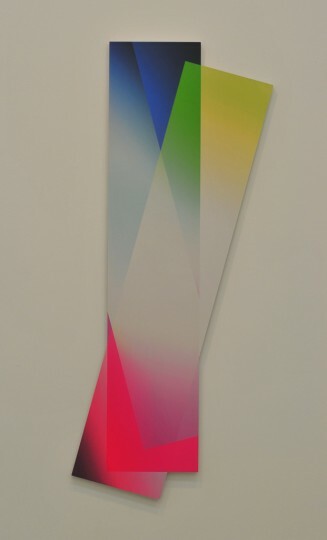 As pure eye-candy, these wall sculptures appear to be flat, rectangular rainbows slipping in and out of alignment – vertigo-inspiring moments in the lives of rotating, intersecting and overlapping semi-transparent planes – snippets from an ongoing process of playful digital manipulation. Now, the reason Vierkant is likely to revel in viewing these on-line reproductions is because his rationale for generating them extends beyond the physical objects on display at China Art Objects in Culver City. His stated intention is to explore the lives of images as they move from direct experience – in this case within a gallery setting – to being seen as reproductions (and reproductions of reproductions.) With artwork now much more often seen on a computer screen rather than first-hand, Vierkant suggests that digital documentation should be perceived as wholly legitimate, stand-alone re-imaginings of the original work. 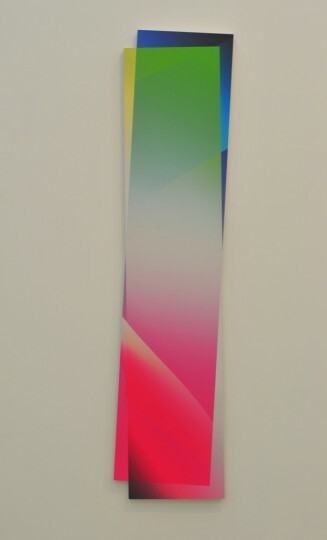 And, to further emphasize this point, the record of his show on the gallery’s website is digitally manipulated to deliver something quite a bit different from what is physically on display. 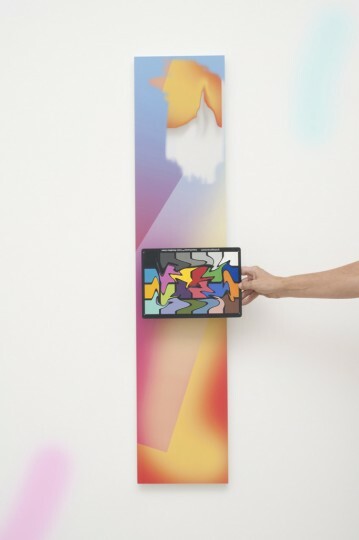 In person, his work is a freeze-frame of colorful digital imagery. Reproductions, like those presented here, are fresh, new and distinct moments in the ongoing movement of the source artwork through time, space and the hands and thoughts of others.